Natal is the capital and largest city of the state Rio Grande do Norte, located in northeastern Brazil in the far east of South America. The city had a total population of 862,044, while Greater Natal had 1,485,505 inhabitants. It is the closest state capital of Brazil to Africa and Europe. The Greater Natal International Airport connects Natal with many Brazilian cities and also operates some international flights. The city has a total area of 170 square kilometres. Natal lies on the Atlantic Ocean, at the mouth of the Potengi River. It is famous for its beautiful beaches, historical sites and lots of natural beauty. 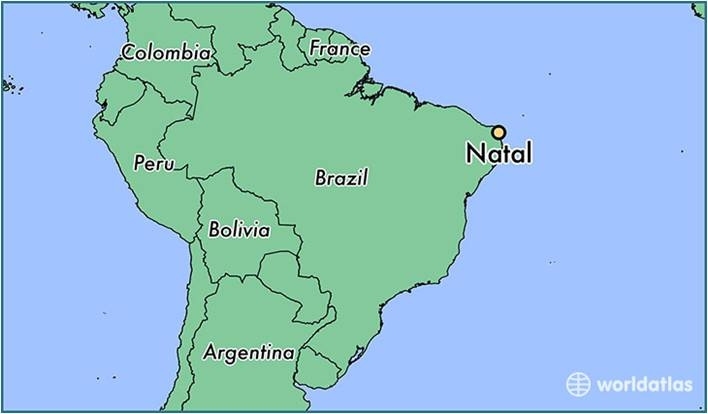 Natal has a typical tropical climate, specifically a tropical wet and dry climate, with warm to hot temperatures and high relative humidity all throughout the year. However, these conditions are relieved by a near absence of extreme temperatures and pleasant trade winds blowing from the ocean. February is the warmest month, with mean maxima of 31 °C (88 °F) and minima of 24 °C (75 °F), while July is the coolest with mean maxima of 28 °C (82 °F) and minima of 21 °C (69 °F). Known as the "City of the Sun" and also as "The City of the Dunes", Natal is located in the northeastern tip of Brazil. Lying about six degrees south of the equator the sun shines on for more than 3,000 hours every year. The average temperature in Natal is about 27 °C (81 °F). During the summer season it normally reaches above 30 °C (86 °F) with the water at a soothing 26 °C (79 °F). The greatest amount of rain falls between March and July. Located virtually at sea level (169 feet), with favorable weather and geographic conditions, Greater Natal International Airport in São Gonçalo do Amarante is 30 km (19 mi) from Natal. Federal Highway BR-101 is the most important access to Natal, coming from the South of Brazil, through the boundary with the municipality of Parnamirim. Leaving Natal, an important access to the southern Potiguar coast is the "Sun Route" (Rota do Sol) as RN-063 is known by, and which takes you to the beaches of Pirangi, Búzios, Tabatinga, up to the municipality of Nísia Floresta. 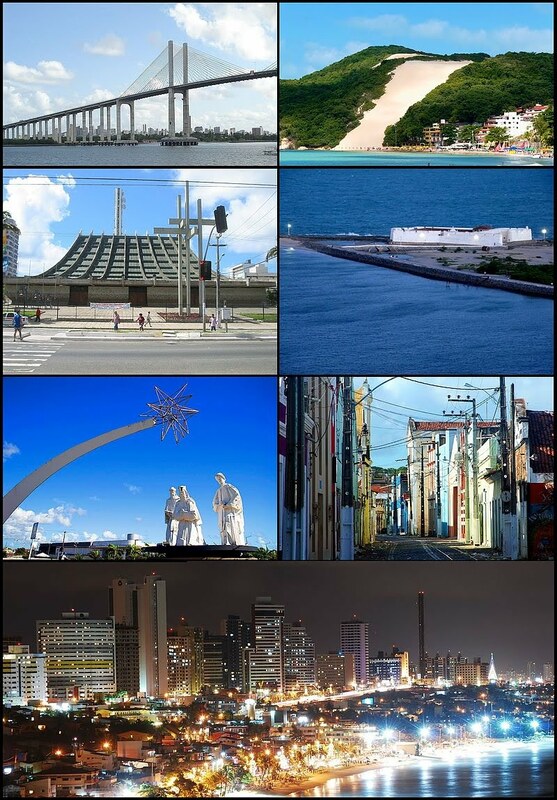 Natal is connected to all the 167 municipalities of Rio Grande do Norte and dozens of locations and Potiguar districts, through the Passenger Bus Terminal of Natal (Terminal Rodoviário de Passageiros de Natal), located in the Eastern Zone of the city. Buses are the cheapest way to move around Natal. Passes or magnetic cards can be purchased beforehand, but it is easiest to pay the conductor. There are large buses, micro buses and vans, driving along the same streets, charging the same fares. All the main touristic spots within Natal are well served by buses. People may expect to travel standing up on the big buses (not so with micros and vans). Typical waiting time is 15 min during the peak hours, up to one hour. There are plenty of taxis in the city. Taxis are white cars and have a red plate. Fares are the same, regardless of how new and comfortable the car is. Fares are regulated by the government. The normal prices are: US$2 to start metering, US$1 per km and US$5 per waiting hour. The only exception to these prices are the so-called special taxis at the airport. From 10:00 pm to 6:00 am at weekdays, and all hours at weekends, there is a 20% increase in the above prices, this is indicated by a number 2 showing in the fare meter. There are several tele-taxis companies in Natal. The dune buggy is the vehicle used most to drive along the beaches. Some companies offer tours in Land Rovers and other 4WD vehicles, these cars offer much more comfort, but buggy drivers claim that the buggy is more flexible. Riding a buggy, people feel the sun and the wind. Buggies are safe, accidents with buggies are much less frequent than accidents with other cars (most dune buggy drivers are certified by the Tourist Authority).